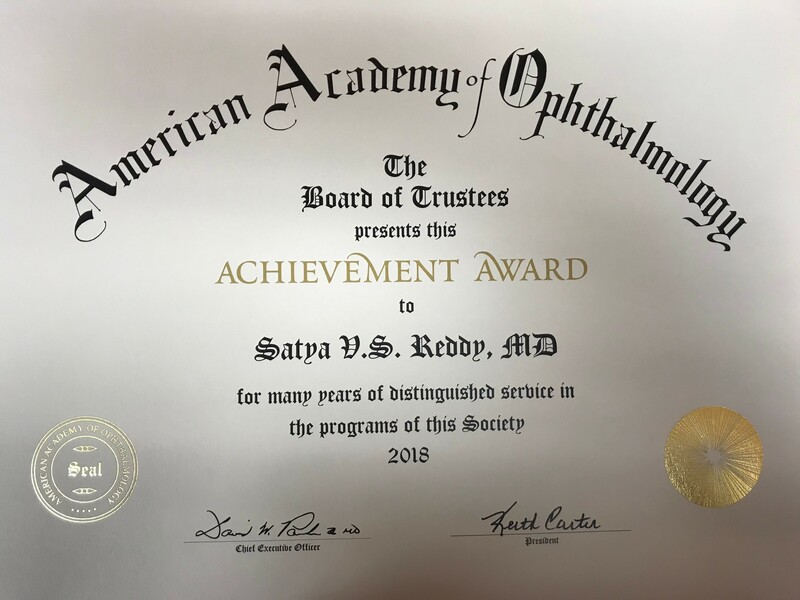 On Behalf of the Board of Trustees of the American Academy of Ophthalmology, Dr. Satya Reddy was presented with this Achievement Award Certificate commemorating all of his contributions to the Academy, its scientific and educational programs, and to the advancement of ophthalmology. Dr. Reddy is part of a group of dedicated volunteers whose contributions support the Academy's mission to protect and empower lives. Because of Dr. Reddy and other volunteers support and participation, the Academy continues to be the preeminent organization spearheading ophthalmic education and advancing the professions.